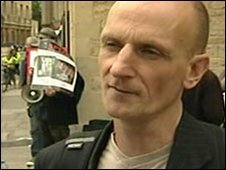 Police officers were recorded saying they would wage a "dirty war" against an activist accused of fire-bombing Oxford University, a court has heard. Mel Broughton, 48, from Northampton, is accused of targeting Queen's College in protest at the University's plans to build an animal research laboratory. The Oxford Crown Court jury was shown a transcript with officers scheming to "get him", defence counsel said. Mr Broughton denies conspiracy to commit arson over the attacks. The sports pavilion at Queen's College was petrol-bombed in November 2006. Mr Broughton's barrister, David Bentley, told the court that the police did not know they were being overheard when the recording was made. The defendant said the officers' comments caused him "great concern". He also told the court that he was constantly watched, filmed and followed by police and their actions made him completely "paranoid". Mr Broughton, of Semilong Road, also denies an alternative charge of possessing articles with intent to destroy property and keeping an explosive substance with intent.